For those of us old enough to remember, or to at least have seen the movies, Vietnam was split in two – the north was the bad guys and the south was the good guys – or so they told us. For more than 40 years Vietnam has been reunified under the official name The Socialist Republic of Vietnam. But in fact, Vietnam has rarely, in its 2,000-year history, been unified. In fact, it has nearly always been split into the north and the south. The north has traditionally been occupied or at least influenced by the Chinese. Chinese emperors from the 11th century to the 19th century dominated the northern region affecting its architecture, language, cuisines and customs. Meanwhile in the central areas (and to a lesser degree southern area), the influence came in the form of the Indo-malays, called the Champas, who rules from 192 to 1832. In the far south, along the Mekong Delta variously the Khmer Empire of Cambodia and the Champa kings battled it out for supremacy. It wasn’t until the end of the 18th century that finally a Vietnamese king Quang Trung unified the country but before long, the French colonialists, Chinese communists, and Japanese imperialists carved up the country again. The American war saw the country officially split along the 17th Parallel and, once again, ancient divisions rose. Vietnam, as a communist country, is officially atheist but most people believe in folk religions – local spirits and gods who are worshipped at fertility, harvest or other festivals. The Cham people who ruled the larger part of Vietnam for the majority of its history were Indo-Malays, bringing with them variations on Hinduism, specifically Balinese Hinduism, which can be seen in the architecture of many temples in central and south Vietnam. In the north, pagodas and temples have a distinctly Chinese style due to the influence of Buddhism, Daoism and Confucianism that filtered down from China. Language has also been affected by the north south divide, with many northern minorities dialects having Chinese influence compared to the southern Khmer influence. It is by no means certain that a Vietnamese farmer in Lao Cai in the north will understand a word of a fisherman in Can Tho in the south would say. Education, television and the internet have obviously ensured language has been increasingly uniform but rural areas still use many hundreds of different dialects and slang from one region to another can confuse even the smartest academic or the most streetwise of stall holder. Likewise, cuisine has been influenced by its geopolitical location. The northerners preference is for noodles over rice, and pork over fish. The southerners like their food spicy and sweet meanwhile. Sugar and coconut milk is used with relish due to its prevalence and influence from neighbouring Thailand and Cambodian. But the hot climate also creates perfect conditions for growing lots and lots of herbs and spices. 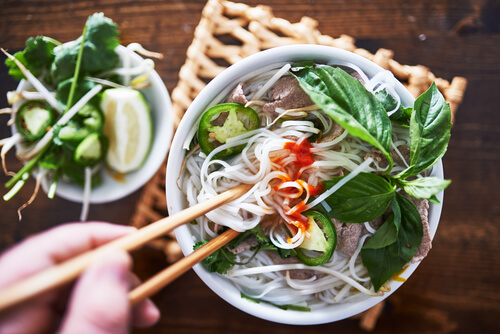 A bowl of pho in the south will be packed with a lot colourful flavourings than its northern (albeit more authentic) counterpart. Coffee drinking has gone from being a pastime to being an art form in Vietnam but really it’s a southern thing. 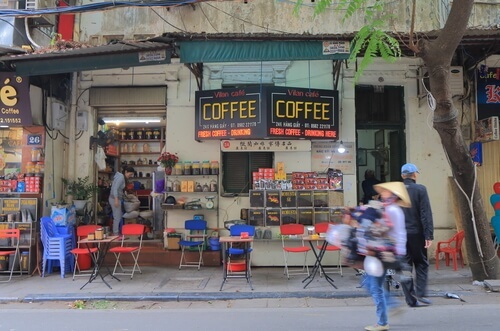 Yes, you can get some amazing coffee in Hanoi – much of it is grown in the Central Highlands but when it comes down to it, many northerners would prefer a cup of hot green tea. Partly thanks to their northern neighbours in China and partly due to the cooler climates. Southerners on the other hand wouldn’t last a day without their iced sweet coffee. It’s obvious that the north is cooler and the south is warmer – not only due to their distance from the equator – but also due to the fact that the north reaches altitudes of 3,000 metres in the highlands and mountains; the foothills of the Tibetan plateau is not that far away. Whereas in the south, the vast low-lying Mekong Delta, spreads out over thousands of square kilometres before petering out in to the sea. Perhaps it’s the cooler climate, perhaps it’s the lack of good sweet coffee, but the northerners can come across a little….‘cooler’ too. 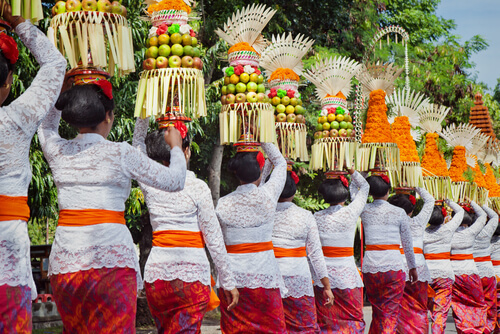 They are regarded as the cultural elite, the politically savvy and the business leaders. Business comes first, pleasantries second. The friendly southerners on the other hand, always have their door open and are ready to make new friends. Warm and welcoming the south Vietnamese (yes, we’re generalising now) are regarded my many as entrepreneurial, innovative and creative. Perhaps it is just the weather after all.